One push on the pedal and your dog has fresh water. Easy to control. Cools your dog down and provides water fun on hot days. Overheating can be very dangerous for the health of dogs. Dogs have barely any sweat glands and can only regulate their body temperature by panting or by sweating through their paw pads. However, in this way, a dog can only release a small portion of its excess body heat. This makes dogs sensitive to heat stroke, which can lead to lasting damage to organs, a coma or in severe cases even death. The AFP Chill Out - Garden Water Fountain is easy to connect to the garden hose. The water fountain gives your dog unrestricted access to fresh water. On hot days, the fountain not only cools your dog down but also offers hours of fun. 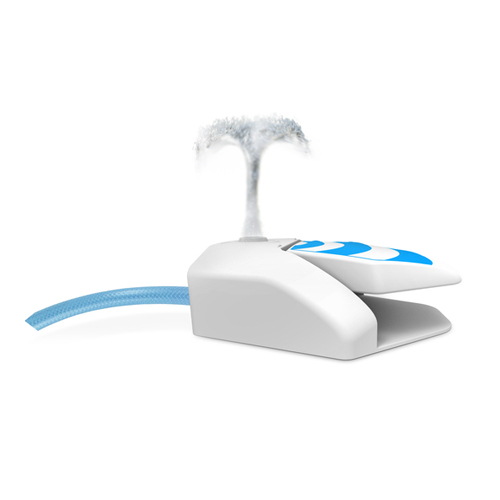 The water toy can be controlled with one push of the pedal. The pedal has an anti-slip layer. The AFP Chill Out - Water Fountain is suitable for all dogs. Have you used AFP Chill Out - Water Fountain before? Let us know what you think about this product.